Leaders play a crucial role in developing and maintaining an ideal safety culture. Great Southwestern management and supervisory personnel make significant investments in equipment, tools, PPE and training to inspire and empower employees to take responsibility for their own actions and those of their co-workers. In addition, effective safety leadership also ensures that safety rules are consistently and fairly enforced; work conditions don’t compromise employees’ safety; adequate time is spent on the front lines interacting with employees; employees are actively involved in managing safety efforts; and ensuring that all safety programs are in place and effective. 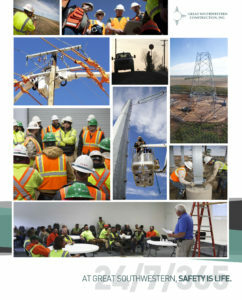 Great Southwestern’s overall safety success depends on participation from everyone in the company. Unless employees feel empowered and supported and know that their actions and behavior make a positive difference, it is difficult to expect complete adherence to a safety program. Our employees are involved at many levels, from performing inspections, participating in safety observation programs, attending safety conferences, conducting training, engaging in speaking opportunities, serving on company safety committees and participating in industry organizations that focus on workplace safety. Having the power to directly influence positive change and behavior is great motivation for supporting and upholding safety policies, practices and procedures, and is a main cultural characteristic of Great Southwestern. Supervisors begin the day by conducting a THA with all employees and subcontractors, and two-way dialogue is encouraged among supervisory staff and employees to ensure understanding of work tasks, potential hazards and mitigation plans. Great Southwestern’s The Wire and MYR Group’s :60 Seconds for Safety (MYR Group) are weekly newsletters distributed to employees that highlight timely safety topics, our weekly overall safety performance, and individual and group recognition for outstanding safety performance. Large Project Safety Incentive Program- This program was developed to recognize and reward exemplary group and individual safety performance and involvement of field personnel on large projects. The program is managed by each project’s safety committee which is formed at the beginning of each project and consists of field personnel and management representatives. The committee’s primary purpose is to manage this program and oversee, monitor and set guidelines for overall project safety functions.